Balance and dizziness service involves diagnostic tests on dizziness related issues, prevention of falls in elderly people, and management of dizziness and balance disorders (including Epley’s manoeuvre). Our balance service is catered for children above 7 years of age and adults. You will need a referral from your GP or medical specialist such as ENT surgeon, Paediatrician or a Neurologist. The tests are performed by state-of-art equipment following a standardised protocol. Balance function tests (also called vestibular tests) provide information on how your inner ears and brain are processing information. We use the information from other sensory systems (visual and touch perception systems) to help us evaluate the body’s balance function. Balance function tests are safe and relatively straight forward. These tests are completely painless and have no side-effects. Some of the tests are designed to give you a sensation of motion, a little unsteadiness or dizziness; but in a clinically controlled fashion. For majority of patients these symptoms only last for few seconds to few minutes. In our 10 years of audiology career, we have never seen or heard of a patient who had dizziness or any other symptoms arising from balance function tests, for longer than few minutes. You may be scheduled for all or only some of the tests described below. Videonystagmography (VNG) and Caloric testing: Our eyes are window to our body’s balance function. Therefore, by recording the eye movement through a specialised infra-red clinical camera system-we can evaluate the balance function in the inner ear and central nervous system. That’s where the name Videonystagmography comes from-it is the video recording of an eye reflex called nystagmus that naturally occurs when your balance system is stimulated. We use different stimulation techniques involving projection of images/dots on the wall via projector, and something called caloric stimulation where the inner ear balance system is stimulated by temperature controlled air. Video Head Impulse Test (vHIT): vHIT provides quick, lesion-specific assessment of inner ear’s vestibular system (semicircular canals) in the natural range of head movements. It is the only test that can assess all six semicircular canals. We use ICS Impulse® kit from Otometrics in our clinic, which is the world’s first vHIT device to combine gold-standard accuracy with unrivalled patient comfort. vHIT is complementary to the caloric stimulation test. It is more comfortable to have vHIT and in some cases e.g. in people with migraine, it may be even safer to use vHIT than caloric stimulation to assess the peripheral vestibular system. Furthermore, vHIT can predict bilateral vestibular losses with more accuracy than caloric test and it can also be used to monitor the progress of vestibular rehabilitation. So, there are clear relative advantages. 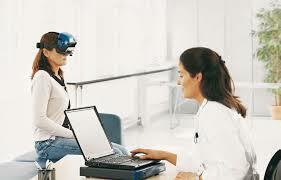 We feel that vHIT should be the first line peripheral vestibular assessment tool in 21st century clinic. Although it does not replace caloric stimulation test that is hitherto considered the gold standard but if a peripheral issue is noticed on vHIT, there may only be a little point in carrying on with caloric testing as it may not affect the management. Vestibular Evoked Myogenic Potential (VEMP): Unlike the VNG and rotary chair testing, VEMP testing does not measure nystagmus. Small surface electrodes are placed on a muscle on your neck, your sternum (breastbone) and your forehead. Headphones, similar to those worn for a hearing test are worn. A loud clicking noise is play in one ear while you look over your shoulder. This done for both the left and the right ear. This test takes approximately 45 minutes. Position and positioning tests: Some of the tests require the body and/or head in a certain position with respect to gravity. Therefore, some tests may involve rotating the head side to side, lying on a couch on the back and on the side and some other clinical positions. As described above, some of the testing may give you a sensation of motion. It is not uncommon for you to feel fatigued for some time after the test. It is recommended that someone accompany you to and from the appointment. However, around 50% of our patients will attend on their own. The testing takes approximately 2 hours and we usually ask our patients to wait for 15-30 minutes following the tests. Please dress in comfortable clothing. As the most of the tests are done by recording eye movement, it is advisable not to wear any makeup around the eye. This includes the cosmetic products applied on the eyelids or eyebrows (eyeshadow) and the eyelashes (mascara). Certain medications or substances may alter the vestibular test results. To prevent this from happening, please AVOID taking any of the following 24 hours prior to your appointment: Alcoholic beverages, sleeping pills or tranquilizers, over the counter allergy or cold medications. If you have been on some anti-dizziness or anti-nausea pills (Valium, Xanax, or Klonopin etc) for longer than 8-10 weeks, continue to take them as usual. It’s best to avoid any caffeinated drinks (tea, coffee, coke etc) up to 2-3 hours prior to balance function testing. Eat a light meal 3-4 hours prior to the test. If you are a diabetic or have low blood sugar, please follow your regular mealtime routine as well as your normal injections or pills. What happens after the test Your audiologist will analyse and formulate the results, which will then be sent to your referring physician. It is often not possible to provide the results straight after the test. We will be happy to provide a copy of these results to you. Please ask the audiologist who you see to get a copy. Further management advice on your condition will be offered by the referring medical specialist.